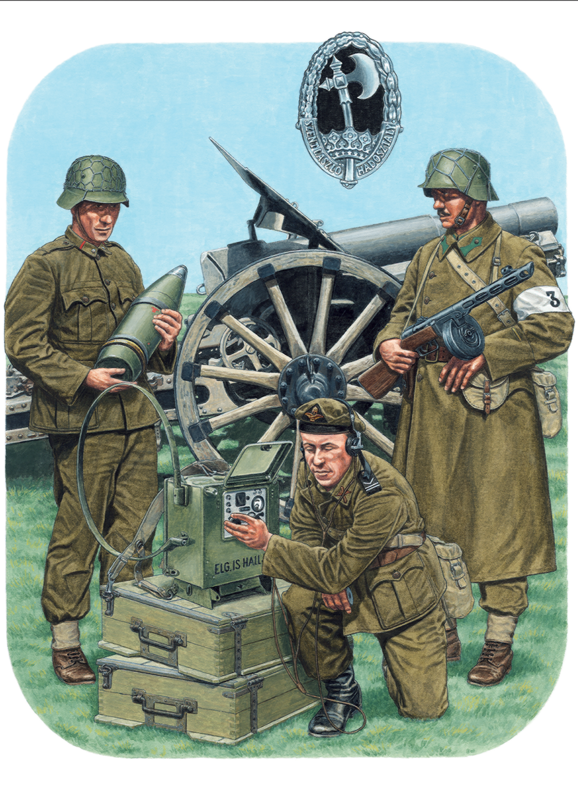 Bolt Action: Campaign: Fortress Budapest brings the siege of Budapest to the tabletop, pitting the heavily-outnumbered German and Hungarian forces against the Soviet juggernaut. The book offers in-depth information on the forces involved, linked scenarios, and new Theatre Selectors - all you need to provide yourself is the forces for the battle! That's where we want to help! There are some fantastic miniatures for the Hungarian army available from Warlord Games, but how are you going to paint them? 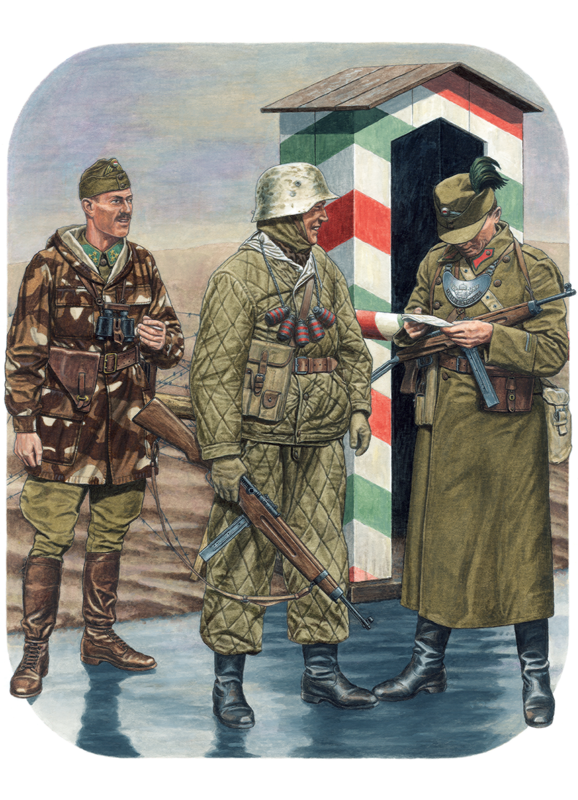 In this blog we're looking at the uniforms of the Royal Hungarian Army, with artwork and extracts taken from Men-at-Arms 449: The Royal Hungarian Army in World War II , written by Dr Nigel Thomas & László Pál Szábó. The artwork is by Darko Pavlovic. This company commander is wearing the paratrooper brown-sand-white camouflage jacket over his field tunic with the parachute qualification badge above the right breast pocket on grass-green cloth backing; several variants existed, including wire-embroidered. He also displays the Combatant Officer badge on the right breast pocket, and the aluminium Szent László badge on the left – an axe with a crooked shaft on a crown in a wreath. He carries a ‘Frommer Stop’ pistol. German M1937 paratrooper helmets were also worn in this unit. This deputy platoon commander wears the rare white/light greenish brown reversible padded winter jacket, and trousers tightened with ankle strings over black half-boots. He has a M1939 Király SMG, magazine pouch, and necklace of M1936 grenades. This warrant officer wears the Gendarmerie field uniform: peaked field cap with green plumes; khaki overcoat with madder-red and steel-green spearhead collar patches with a silver Gendarmerie platoon- or post-commander’s crowned button, and a M1944 Field Security duty gorget; breeches and black leather riding boots. His weapon is the M1943 version of the Király SMG. This gunner wears his field tunic with scarlet collar patches replaced by cloth strips due to material shortages. He wears M1943 trousers with canvas anklets and ankleboots, and has discarded his field equipment while serving a field gun. This radio-operator wears the khaki Air Force enlisted field uniform, with brown crowned ‘Turul’ hawk cap badge on a black triangle on the beret with black cap band and neck ribbons. The tunic has a white braid chevron and two rank bars on black shoulder straps, brown winged-propeller collar badges, and brown crowned hawk buttons; on the left breast pocket is the aluminium Szent László badge on black branchcolour cloth. He wears long trousers and black half-boots, and operates an R-3 radio. This platoon commander wears Hungarian Army uniform with a white armband showing the company number. He has picked up from the battlefield a Soviet PPSh 41 7.62mm SMG and a khaki canvas pouch for its distinctive drum magazine. His overcoat has infantry officers’ gold-buttoned spearhead collar patches and cuff rank insignia. Bolt Action: Campaign: Fortress Budapest comes out on 21 March 2019. Order your copy today!